Good listeners listen for the theme in what a person is saying. They then play back what they have heard to check that they understand the picture inside the person’s head. This approach can be applied in both your personal or professional life. You can use it when encouraging a team member, clarifying a brief with a customer or listening to your partner. Let’s explore this approach. Imagine that a person has asked to meet with you to get some advice. They may want to talk about how to tackle a challenge, how to take the next step in their career or some other topic. 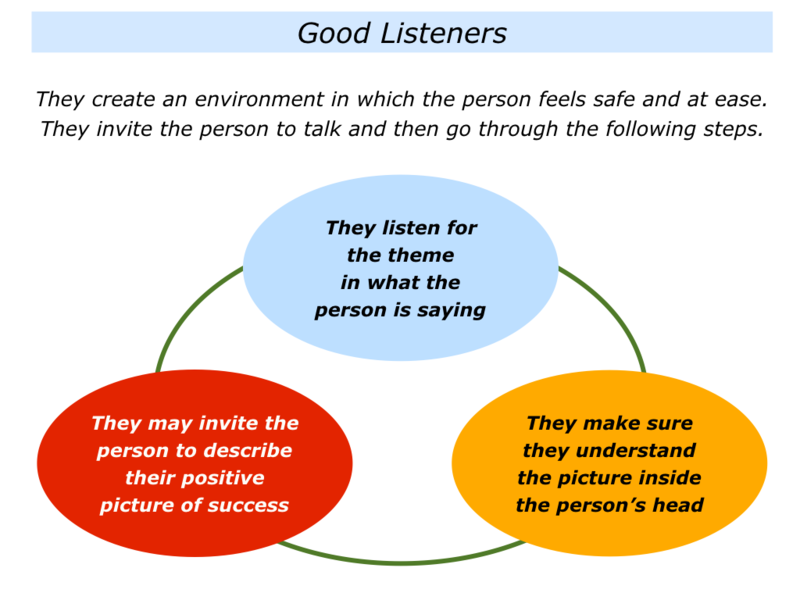 Good listeners start by creating an environment in which the person feels safe and at ease. They then encourage the person to open up and talk. Different people do this in different ways. One approach is to ask the person some of the following questions. What would you like to talk about? What is on your mind? What is happening in your world? Are there any challenges or other topics that it might be useful to explore? Imagine that you have created such an environment. The person has opened up and begun talking about a particular topic. It can then be useful to take the following steps. Good listeners listen carefully to what a person is saying. They often look beyond the words, however, and look for recurring patterns. They listen for the theme in what a person is saying. Are you saying that … ? Keep going until the person says: “Yes, that is right.” You can then move on to the next step. People see and interpret the world in different ways. So it is vital to understand what a person means when they explain their situation or talk about their goals. This calls for making sure you understand the picture inside a person’s head. Later we will look at how to take this step. 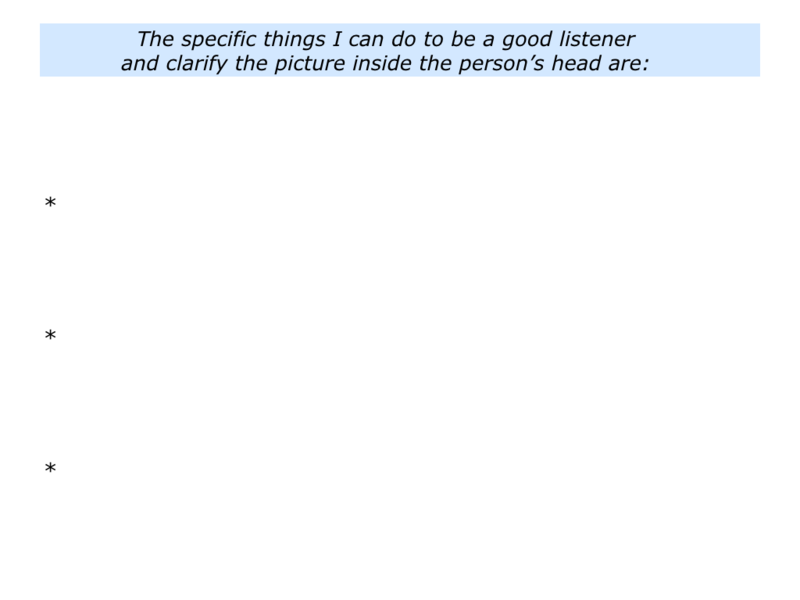 Before then, however, here is a communication exercise that illustrates how people see things differently. The exercise is called What Colour Is Your Horse? Imagine that you are giving this exercise to people. Here are the instructions for the exercise. You start by explaining that you are going to invite people to do an exercise on communication. You then invite people to close their eyes and give them the following instructions. Imagine a field in the country. In the field there is a horse. It is up to you what colour the horse is. It could be black, brown, white or another colour. There may be other animals around. There might be a farmhouse or other buildings nearby. It is up to you what kind of day it is. The horse runs around the field, jumps over a fence and runs away into the distance. You can open your eyes now. Form pairs and each spend 30 seconds describing your picture. People interpret information in different ways, so you may then say something like the following. “Every person’s picture is right for them. 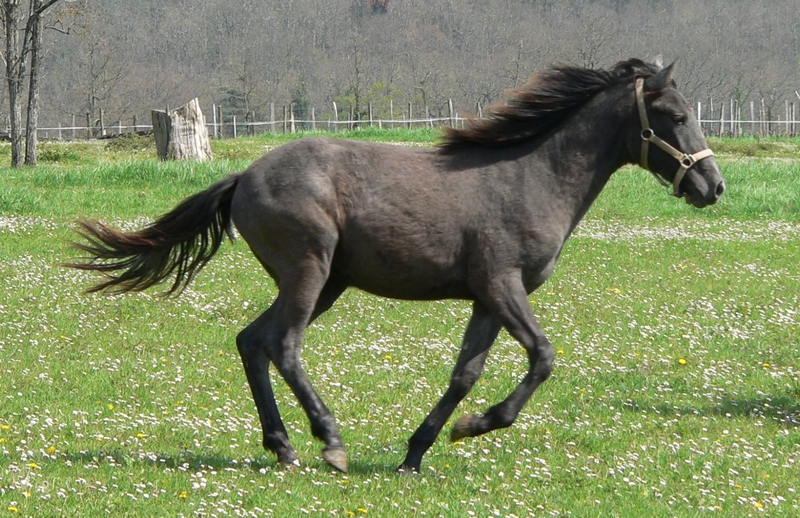 You would think it was crazy if you saw a black horse and I said you got the wrong colour – it was white. But have you ever been in that situation? “You may think you have made an agreement with somebody. But then, when you follow up afterwards, they say you have got the wrong picture. This can happen with a boss, colleague or other person. “Good communicators often finish a conversation by making clear contracts. They make sure everybody has agreed on the colour of the horse. As far as I understand it, these are the specific results you want achieved. This is the timeline and this is how you want us to keep you informed. Is that right? Good communication calls for double-checking your understanding of the other person’s view. It is vital to understand the agreed picture. Imagine that a person says they want you to ‘encourage’ them. Do they mean to praise them all the time, give positive but realistic feedback or make suggestions about how they can improve? Imagine that your partner says they want you to change your behaviour. Do you understand the actions they want you to stop? Do you know what they want you to do instead in the future? Let’s explore another step that can be taken to help a person to reach their goals. Imagine that you have listened to a person and shown you understand the issues they face. If they have asked for your advice, for example, you may say something like the following. As far as I understand, this is what is happening. Is that right? If so, is it okay if I share some ideas about the possible ways forwards? Good mentors always go through this step. They check with a person that it is okay to share ideas. Why do they take this step? Some people simply want to talk about problems but not do anything about solving them. Other people are prepared to do the work involved in exploring solutions and achieving success. Good mentors follow the rule: A person must have the will before they can learn a skill. They therefore check if it is okay to share knowledge with the person. Imagine another situation. What can you do if the person simply keeps talking about negative things? One approach is to use what are called Flip Questions. It is to invite the person to describe their positive picture of success. Here are some examples of using such questions when helping a person. At the moment you say that you feel bad. What would you like to feel instead? Would you like to feel calm, at ease or to have some other feeling? If you wish, we can explore how you can increase the chances of feeling this way in your life and work. At the moment you say that a certain person behaves in a way that causes problems. How would you like them to behave instead? What are the actual things you would like them to do in their interactions with people? At the moment you say that some people in the team behave in ways that hurt others. I can offer some practical tools for dealing with these situations, but we can also look at your longer-term goals. Looking 6 months ahead, what would you like the people in your team to be saying, thinking and feeling? If you wish, we can look at how to achieve these things and build a successful team. You will have your own approach to inviting a person to describe their positive picture of success. If appropriate, you can then pass on knowledge or offer practical tools they can use to achieve their goals. Let’s return to your own life and work. 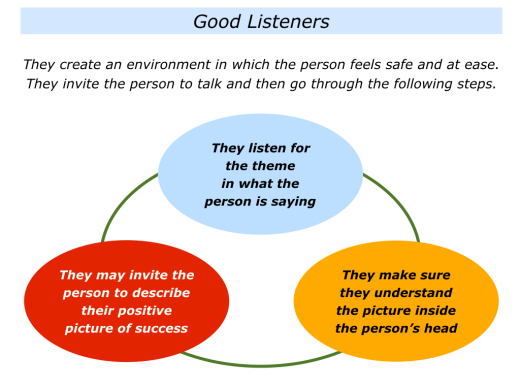 Looking ahead, can you think of a situation in which you would like to be a good listener? You may want to apply these skills in your role as a friend, parent, partner, manager, leader, counsellor, coach, mentor, educator or whatever. Looking at this situation, how can you help the person to feel safe and at ease? How can you enable them to talk openly and freely? How can you listen for the theme in what they are saying? 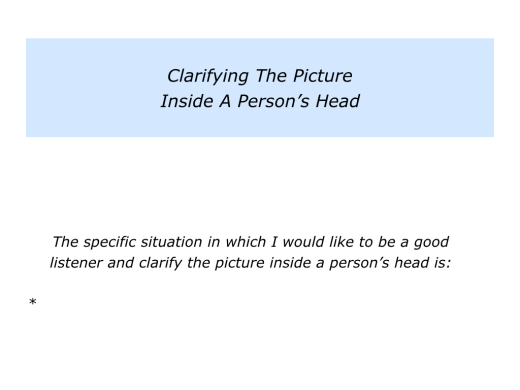 How can you clarify the picture inside the person’s head? 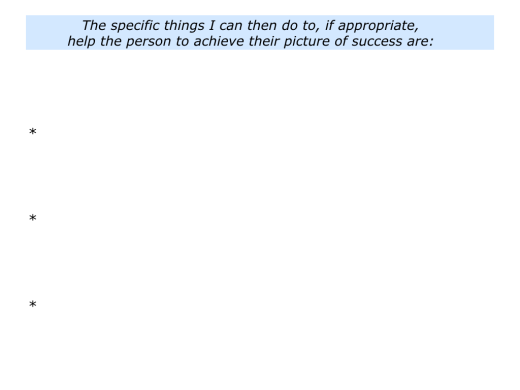 How can you, if necessary, invite them to describe their positive picture of success? How can you then, if appropriate, help them to achieve their goals? 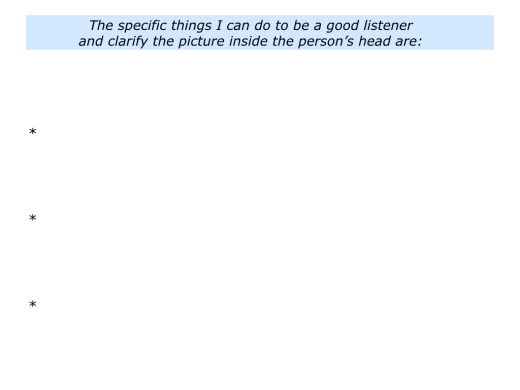 Describe a specific situation in the future when you would like to be a good listener and clarify the picture inside a person’s head. 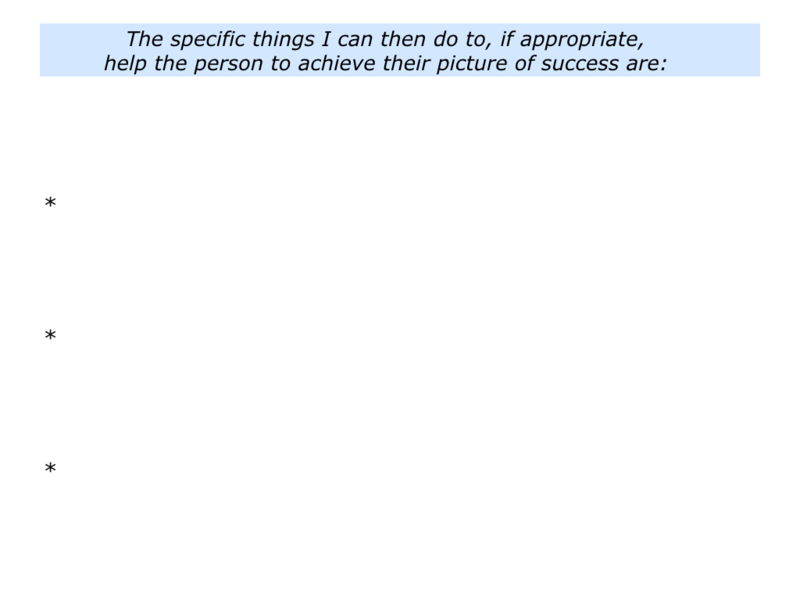 Describe the specific things you can do to, if appropriate, help the person to achieve their picture of success.